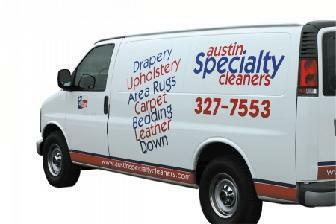 Austin Specialty Cleaners provides guaranteed cleaning of all types of drapery, shades, upholstery, area rugs, carpet, bedding, fine linens, leather, tile, natural stone and grout. Founded in 1978, we have evolved into one of Austin's most highly experienced specialty cleaners. Recommended by Austin's leading designers, fine furniture retailers and dry cleaners, our knowledgeable staff has the experience required to safely and thoroughly clean even the most delicate of fabrics. Although you will find that we are not the least expensive cleaning company in town, we do promise that you will get what you pay for. Have a look around our website and call us today at 512-327-7553 for a free, no obligation estimate. Austin, West Lake Hills, Lakeway, Rollingwood, Round Rock, Georgetown, Cedar Park, Leander, Pflugerville, Kyle, Buda and Manor. Services are available in outlying areas with a $400 minimum charge. Trip charges may apply. We service all areas of Texas with variable minimum charges and trip charges. Email the owner directly with photos of requested cleaning at kc@austinspecialtycleaners.com. Smaller items can be shipped directly to our plant at 9406 Business Dr Austin TX 78758. Please allow up to three weeks turnaround on shipped items. Specialty repair, recoloring, cleaning and protection of leather furniture as well as cleaning of fabric furniture and draperies is available on a limited basis. Email the owner directly with specific requests at kc@austinspecialtycleaners.com . Smaller items can be shipped directly to our plant at 9406 Business Dr Austin TX 78758. Please allow up to three to four weeks turnaround on shipped items. These international services are available with three months notice for leather cleaning, protection, recoloring and repair as well as fabric cleaning and protection. Service to specific countries may be limited by local equipment or product import and availability issues. Email the owner directly with specific requests at kc@austinspecialtycleaners.com . For a list of our referrals, please click here. For directions and hours, please click here. To schedule on line, please click here.